"Blackberries are plentiful where I am, and they taste great. Here is a recipe for such a pie. The pioneers thought that blackberries were a weed. Gradually it came into cookbooks for medicinal purposes - blackberry syrup for cholera and summer complaint. This nuisance became very popular, and the berry is unique and very tasty." Line a 9 inch pie pan with half the pastry. Save remaining pastry for top crust. Chill both while preparing the blackberries. 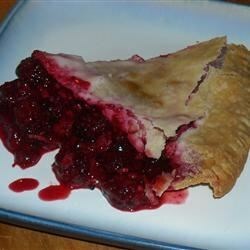 Combine berries, flour, sugar, and lemon juice. Spoon into pie shell, and dot with butter or margarine. Cover with top crust, and slash in several places. Bake for 15 minutes. Reduce heat to 350 degrees F (175 degrees C). Continue baking for 35 to 40 minutes, or until browned. Wonderfully simple and very tasty recipe. Only change was that I needed to bake it longer than the stated time. Very good! I added more flour, as others had suggested, still a little runny. I think I'll do cornstarch next time. Also cut sugar to 3/4 c. Thanks!